Has Catherine Ashton thrown a dangerous gauntlet to Spain? An interesting power struggle may be developing between current High Representative Catherine Ashton and the current Spanish rotating presidencies of the European Union and the Western European Union. It is possible that Catherine Ashton's old allegedly Communist ties will enter before it is over. 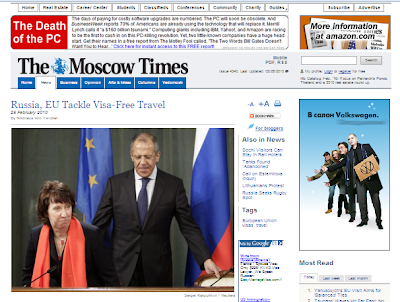 She has announced that she is exploring visa free travel between Russia and the European Union. She further announced that the Lisbon Treaty made it clear that the responsibility for European foreign policy lay with her office and not elsewhere. Perhaps the greatest gauntlet she has tossed down is her proclamation that no Spanish officials will attend the forthcoming European Union - Russian Summit, scheduled for March, 2010. Spain, which currently holds the rotating EU presidency, announced last month that the EU would start a process to ultimately lift visa requirements. But similar attempts have yielded few results in the past, mainly because of technical difficulties and fears among EU members of a mass influx of refugees. Migration rules are stringent on both sides, although Russians must undergo interviews and demonstrate that they have sufficient funds for travel before obtaining visas to the EU’s border-free Schengen zone. Europeans wishing to travel to Russia are spared those procedures but face stiff bureaucracy, having to register and deregister if they spend three or more working days at any place in the country. Asked if registration rules might be eased during visa negotiations, Lavrov denied that the rules posed a bureaucratic burden. “There is no registration requirement. There is a notification requirement that involves no permits. You fill out a simple form and send it stamped by post to the nearest migration service office. … If you stay in a hotel, you do not have to do anything," he said. Yet the registration process, which is the bane of foreign visitors, has been further complicated with the introduction of a fee in late January. A registration now costs 2 rubles for each day of the visit, with a ceiling at 200 rubles ($6.50). “You must present a receipt from Sberbank showing that you have paid the fee," said Alexei Filipenkov of the Visa Delight agency. Ashton has faced a series of challenges since assuming her job in December, when the Lisbon Treaty amalgamated the jobs of high representative (formerly Javier Solana) and external relations commissioner (formerly Benita Ferrero-Waldner). Brussels has been awash with reports about doubts on whether the comparably unknown British Labour politician, who served as EU trade commissioner for just a year, has enough international experience for the job. Questions have also been raised on the rotating presidency’s future role in foreign policy, and critics have said Spain stole the limelight from the high representative’s first weeks in office. But Ashton was adamant Wednesday that she was the sole person in charge, having also assumed external policy obligations formerly held by the rotating presidency. “The Lisbon Treaty is clear about my post. … The presidency will not disappear, but the responsibility [for foreign policy] will be in my office,” she said. I rather suspect that the European Union officials who have been jealously guarding their past prerogatives will not react kindly to this. I further suspect that Javier Solana or one of his designees might well be a beneficiary of actions taken as a result of their anger. I have a feeling that Catherine Ashton might soon be the victim of a predictable coup. Her political fall could come just as rapidly as did her rise to sudden illusory appointive power. She appears to me to be dangerously isolated. Time and events will tell. One thing for certain: She may have been appointed to the office of Europe's chief diplomat; however, she has handled this awkward situation far from diplomatically! TO MY READERS: JD, Susanna, and Dorothy have worked hard to follow these developments in what I have shorthanded "cashless society." JD proves solid links to powerful business, occult, and globalist interests -- some of the worst of the worst.' There were biblical warnings that an hour of temptation would come "like a snare upon all those who dwell on the face of the Earth." As we see earthquakes in so many places, also a sign we were warned to watch, we need also observe signs of the times in our financial and 'personal convenience' arenas. JD has established his own blogspot and is freely making his valuable work available to us to 'share and pass on.' I also pass on that I have had my well documented differences with Farmer (Bjorn Freiberg) and last July I removed my link to his spot, but he has European access to the recent activities of Javier Solana and compatriots that are difficult to obtain elsewhere. Take the wheat and leave the chaff! In Part 1, I introduced you to GS1. A United Nations sanctioned not for profit organization with an intent to tag every thing with RFID technology. In this article I will expand on GS1, as well as introduce you to pilot projects, organizations, and people working to implement this agenda. This article will give readers a introduction to the cashless society, as well as the groups and people behind it. To fully understand this portion of the agenda, a brief review of some history is necessary. Many reading this will be familiar with the Earth Charter. This document more than any other helped lay the foundation of the Green movement. It was the base upon which the Kyoto Protocols and the failed Copenhagen Climate Summit were built. It has been well reported that Maurice Strong was instrumental in the founding of this document. What is not as well known to many are the signatories or drafting committee for this document. The drafting committee, which was hand selected by Mr. Strong and his friends, was chaired by Steven C. Rockefeller. It's signatories include notable names such as Federico Mayor, Mikhail Gorbachev, Muhammad Yunus, and Al Gore. Yunus is a interesting fellow. A former Elder, in 2009 he resigned his position with the group, citing an inability to uphold his commitment to the group due to his work. The same work that has earned him the moniker of banker to the poor, the same work that brought him notable mention as part of the "Group of 12 doing the great work" during World Invocation Day 2008. Yunus is also listed as a ambassador for Lucis Trust's World Goodwill. This is the same World Goodwill currently listed as a Non Governmental Liaison to the United Nations. To his resume, Yunus can also addNobel Laureate and card carrying member of the Clinton Global Initiative. So what is the work that has brought Yunus such connections? In the 1970's Yunus was the pioneer of microcredit, a open ended financial structure used to provide people in impoverished countries with funding for small businesses, life sustaining needs, and infrastructure projects for those poor nations. These loans are provided to groups of people or nations as opposed to individuals. The individuals within the groups are then accountable to the whole of the group. If a single individual within the group fails to make their allotted payment portion, the group as a whole is cut off from the provided line of credit. These lines of credit can continue to be borrowed against indefinitely, which simply extends the pay off date for the group. In 1997 Yunus partnered with Lisa C. Billingsley, L. John Doerr, and Steven C. Rockefeller Jrto form Grameen Foundation. Grameen and its numerous subsidiaries are United Nations sanctioned not for profit organizations providing microcredit loans around the world. It is through this organization that many aspects of this agenda will come into focus. To get an idea of the pull that this organization has, let us first briefly examine the remaining founders. L. John Doerr is a very prominent man in financial circles. He has managed capital funding for Intel, Intuit, Sun Microsystems, Compaq, Netscape, Amazon, and Google. Doerr has also participated in the World Economic Forum. Forbes has estimated Doerr's net worth as over $1 billion. In 2008, Doerr and Steve Jobs announced the founding of a $100 million iFund for the development of technology associated with the iPhone. Together they proclaimed the iPhone as the future of computers, while Doerr proudly proclaimed it as the beginning of a new world order. Doerr is also a partner at Kleiner, Perkins, Caufield, & Byers, an investment firm whose interests include green technologies, RFID, health care, and projects working toward collaboration amongst these sectors. Doerr also currently sits on President Obama's Economic Recovery Advisory Board. Programs like Cash for Clunkers, the Stimulus Package, as well as every other major economic policy put forth by the current administration can be directly attributed to Doerr's influence. Much like Yunus and Doerr, Steven C. Rockefeller Jr is a man who wears many hats. As a member of the infamous Rockefeller clan, Steven Jr proudly serves as a member of the Rockefeller Foundation, a group that has been tied with many New Age projects. Maurice Strong was a trustee for this group before his extended vacation to China. Another of Steven Jr's many roles includes his seat on the advisory board for Sparta Commercial Services, the nations leading power sports financier. There have been many financial deals made via this group that have benifited the RFID industry, but for the sake of space in this article, I will reserve exploring these for a future piece. Steven Jr also serves on the board of Soros Economic Development Fund. Through this fund Steven Jr along with George Soros have funneled huge sums of money into this agenda. I will be exploring these investments in depth in a upcoming article dedicated strictly to the funding of this system. One of the most notable of his many job titles is as the head of an advisory board for a company named CEO America. This company operates as the parent company to two different yet equally important companies in this agenda. The first is a company namedCarbon Creditz. What they sell is exactly what their name suggests. However it is how they operate that should be of interest to readers, as Carbon Creditz operates in conjunction with CEO America's other company to sell their carbon offsets. The second company I am referencing is named Creditz. Creditz bills itself as the world's first digital currency system. In addition to the cross operations between Creditz and Carbon Creditz, Creditz also operates in conjunction with Grameen and its subsidiaries as the preferred repayment system for the microcredit loans Grameen provides. What has become of particular interest to this researcher is the interoperability between this digital currency system and RFID technology, as Creditz promotes customers who choose to do business via RFID to a higher standing than other customers. They refer to this as their Loyalty Payment System. CEO America has also signed some very lucrative marketing and development deals with Applied Digital Solutions through its subsidiaries of Verichip, Verifone, and Veripay. One should also take note that during the development of the Creditz and Carbon Creditz systems, companies like Verichip, IBM, Microsoft, Merryl Lynch, and Deutsche Bank among others, were tapped for funding and development of the system. Now that we have established an understanding of these groups, you may be wondering how this is relevant to the coming global governance or the subject of my first article, GS1. Grameen and its members are active participants with Advocates for International Development, a not for profit advocacy group whose sole purpose is promotion and implementation of the United Nations: Millennium Development Goals. A4ID also partnered with groups such as Brookings Institute, Save the Children, World Trade Organization, and World Health Organization to help in their advancement of the Millennium Development Goals, the same goals that are the basis for all international sustainable development projects including Agenda 21, a model that includes massive depopulation goals as well as massive land seizures under the guise of sustainable development. Which brings us back to GS1. How might a impoverished nation go about implementing GS1 Standards when said nation does not have the funds to update it's infrastructure to meet them? The answer is GS1 partner organizations within said countries who take out microcredit loans from Grameen to fund the new infrastructure. This is already happening in impoverished nations like Indonesia, Cambodia, many Latin American nations, Singapore and Bangladesh just to name a few. Now that readers have a better idea of what this system looks like and how it is being implemented through out the world. We can go forward in future articles and explore connections to United States elected officials, major corporations, the funding behind the system and much more. As always questions and discussion of the material presented here is encouraged. Again, special thanks go out to Susanna for her continued help in this project. There is still a lot of material to cover in future articles. So stay tuned! MASSIVE 8.8 EARTHQUAKE HITS CHILE! MASSIVE 8.8 EARTHQUAKE HITS CHILE! Tsumani warnings are in place for most of Pacific. I could have warned Catherine Ashton this would happen . . .
UPDATE: JD's Part 2 of his TRACEABILITY IN A SUSTAINABLE WORLD is up over at his blogspot. I'll give this a couple of days to digest and put it up here then. Those positions look like a lot of fun when one is down there shooting at them. When one is up there being shot at, it's not quite as nice. Catherine Ashton looked so delighted at her surprise EU "High Representative" appointment, as did her lovely daughter, that it seemed a shame to anticipate the soon breaking of her bubble. But that appears indeed to be what's happening. "The EU: reprimanding the Baroness over Moscow and Kiev, and the charisma of a damp rag"
" . . .behind a stultifying period of business routine, with the first series of haggling and squabbles since Lisbon (where the group reformed itself) now well underway. This was bound to happen sooner or later. It was inevitable after the organization adopted a new charter on December 1, 2009, underwent major restructuring, a change of leadership and the redistribution of authority. New brawls break out over mundane issues such as who the boss is now, why them and not someone else, and should they act like that? Or why are they behaving this way and not differently? The most curious thing is that a serious misunderstanding recently erupted over the recent visits to Moscow and Kiev by Catherine Ashton, the EU's High Representative for Foreign Affairs and Security, who met with President Dmitry Medvedev on February 24 and represented the EU at the inauguration of the Ukrainian president-elect, Viktor Yanukovych. Her visits to Russia and Ukraine coincided in time with a two-day meeting of EU defense ministers in Palma de Majorca. Although they mostly discussed routine issues, some of the ministers took offence at the Baroness of Upholland choosing Russia and Ukraine over the Balearic Islands. The worst part of it is that Baroness Ashton's move offended the "big" European nations. French Defense Minister Herve Morin set the tone, berating the EU's top diplomat for failing to attend the meeting: "Isn't it rich that this morning, to display the ties between NATO and the EU, we have the NATO secretary general (Anders Fogh Rasmussen) here but not the high representative for the first meeting since the Lisbon treaty came into effect?" General discontent began to grow after this statement. Some of the ministers said in private that either the new European Union President Herman van Rompuy or Manuel Barroso, President of the European Commission, could have been sent to Moscow and Kiev. They said that her predecessor Javier Solana always managed to find space in his diary for the EU defense ministers' talks. She was also reminded for the fact that this was not the first time she had missed a defense meeting. In politics, when one comes in for criticism, it is always good to know where that criticism is emanating from. This would also reveal where the discontent within the EU lies and what to expect in future. The French deny instigating this attack on the English baroness, although this is difficult to believe if one reads Paris newspapers. They even contain hints on her flawed past, since she was a Labour party activist and one of the women at Greenham Common peace camp protesting against the deployment of U.S. cruise missiles in Britain; she was even accused of being "bribed by the Soviets." Pierre Lellouche, the French Minister of State for European Affairs, criticized her for failing to rush to Haiti after it suffered a devastating earthquake on January 12. She should have "flown the flag" in Haiti, grumbled the French minister sighing that, alas, "not everybody is Nicolas Sarkozy". Lellouche is a great supporter of his president. The French in fact supported Ashton's nomination, but now they are indignant because she is overly engaged in foreign politics. France would have preferred that to be Sarkozy's to define. Ashton's entourage agree that she could have left Kiev to President Van Rompuy, but insist she had to visit Moscow because Foreign Minister Sergei Lavrov had invited her. Van Rompuy almost had a free day on February 25, giving one lecture to students at a small college in Bruges. Van Rompuy's team retorted that he was too high up in the EU to attend such an inauguration ceremony. A source in Barroso's office hinted that she was indeed taking on more responsibility than she could handle. Three top European Union officials are already deeply entrenched in this bickering. This kind of brawling is not doing the EU any good; moreover, it makes the Lisbon treaty's opponents ever more confident that the treaty was not ready, unfinished and only served to confuse things rather than to streamline the organization. Now the EU is managed by a trio: President Van Rompuy, Prime Minister Barroso and Foreign Affairs and Security Policy High Representative Ashton, with each of them clearly trying to grab as much authority as possible. Their powers are in fact only vaguely described in the treaty which, although intended to streamline the EU governance structure, in fact has made it even more difficult to answer the famous rhetorical question asked by former U.S. Secretary of State Henry Kissinger: "Who do I call if I want to speak to Europe?" This issue is even more confused. Who should Russia call to push through the visa-free entry issue or the new partnership and cooperation treaty? Who is more authorized to discuss these issues - Barroso, Van Rompuy or Ashton? UKIP MEP Nigel Farage tried to defend his compatriot who came under attack as she found herself in the middle of the brawl. He told Herman Van Rompuy, the president of the EU, in the European parliament that he had "all the charisma of a damp rag and the appearance of a low-grade bank clerk." "Who are you? I'd never heard of you, nobody in Europe had ever heard of you," Farage said. His comments on the EU's new leadership were so vivid that he was immediately labeled enemy number one in the Belgian media. In addition he dismissed Belgium as a "non-country." Belgian Prime Minister Yves Leterme even complained to the President of the European Parliament Jerzy Buzek. But all attempts to make Farage apologize only made things worse for Belgium. When Belgian Socialist Party MEP Veronica Kaiser tried in a gentle "womanly" way to remind him of his manners, he said that, although she was certainly "very sweet and rather pretty", he would not apologize for Belgium being "a completely artificial construction and a mistake." My personal opinion? I suspect she was put there for the express purpose of failing. The reason that might be true? Possibly to create a Weimar Republic style vaccuum government to justify consolidation of power in others with perhaps less altruistic motives. I do not for one solitary moment envy Catherine Ashton. I suspect her migraines are coming with increasing frequency and intensity. This MIGHT be IMPORTANT - EU Ministers to explore "common defence strategy"
2. on PARANORMAL INTERNET RADIO, 9 p.m. Eastern Time, It appears that the European Defence Ministers are regrouping soon. It also appears that Catherine Ashton is coming under increasingly unfavorable scrutiny from that circle of European public officials. Please listen in and give me feed back on each. EU MINISTERS TO EXPLORE COMMON PERMANENT STRUCTURED COOPERATION DEFENSE!!! "BRUSSELS) - EU defence ministers, meeting in Spain Wednesday, will consider increased military ties authorised by the bloc's Lisbon Treaty, but with EU diplomatic chief Catherine Ashton notable by her absence. She cancelled her participation in the defence talks, in part to represent the European Union at the investiture ceremony of the new Ukrainian president, her spokesman said. Some participants at the Palma meet had been hoping to hear Ashton's intentions as the first holder of the beefed-up foreign and defence job. "Especially as, thanks to the treaty, the opportunity is there to reinforce Europe's defence, to give it more visibility," as one European diplomat put it. "Something has changed in the order of priorities," she added." Most interesting to me is the discussion of "Permanent Structured Cooperation." That was an integral part of the never ratified European Constitution. Spain, which holds the EU's rotating presidency for the first half of the year, had made the relaunch of a European defence strategy one of the "fundamental" objectives of its six-month tenure. "We are starting from scratch with the Lisbon Treaty," as another European diplomat put it. That text, which had a long and painful gestation, offers the possibility of a pilot group of EU nations to work together in a particular military area, without fearing a veto from another European capital. The only condition for creating such a "permanent structured cooperation," as the eurospeak puts it, is that there is a qualified majority of the 27 EU nations in favour. Several countries, notably France, believe that defence matters should not be lost in the future European diplomatic service, under Ashton, and that it should conserve its specificity. Regardless of Ashton's role, the key initiatives remain decisions for the 27 national capitals. Certain forces we have been long watching have obviously been laying low. I suspect we are about to see an "emergence" of more than a "Raj Patel" or Benjamin Creme type fantasy. Things may be about to heat up again -- in Europe -- land of "Recommendation 666" and "Section 666." Are Benjamin Creme and Raj Patel diversions or the real thing? Time and events will tell! Note: Perilous times are very much hear and our JD and Susanna are methodically documenting them. I urge you to visit his blogspot and place your comments there as well as here. Many profound thanks to JD and Susanna for their work and I look forward to reading MUCH MORE. Picture a future where your right to privacy is a thing of the past. Where your government, doctor, retail stores, your home, your neighbor, and you keep accurate details of every transaction you make, whom you associate with, the amount of every and any goods you use, where you worship, your impact on the planet, your impact on your community, and any other piece of data that can be recorded as it pertains to your life. Many of us have seen articles and books that advocate for just such a world. Many more of us have read opinion pieces, and heard rumors of plans for such societies. Most recently as the Healthcare debate was heating up here in the United States, a group promoting Congressman Ron Paul published an article on it's website claiming that such a system via microchipping had been written into the Healthcare Reform Bill. Is any of this true? If so, who's behind it? If so, how far has such an agenda spread? How close are we to implementation of such a systematic society? A short time ago, I asked Susanna, a research associate, to help me dig into these questions. What was found during our investigation will shock some, and will be hard to believe by others. In this article, and those that follow, I will attempt to answer all of these questions and many more. Our investigation will show that such an agenda not only exists, but is far more advanced than anyone had imagined. We will explore the history, funding, and implementation of the many arms of this agenda, as well as some that have taken hold under our noses while no one noticed. Over the course of this series of articles we will cover many subjects from U.S. Politics to Social Media, from international treaties to social services, from iPhones to Echelon. The full scope will take time to explore, and may take a few of these articles to become 100% clear to some. While others may begin to immediately see the bigger picture. As is suggested by the title of this part, this article is a introduction to the overall agenda. Here we will begin with the outline of the subject, which is global in nature. As I have found, one of the reasons this agenda went unnoticed is because many don't know what to look for and if they have seen it, it was not recognized for what it was. This is no fault of the average observer. There have been slick redefinitions of terms that have allowed this agenda to remain under the radar for as long as it has. So in a nut shell GS1 is a organization that sets standards for supply chains internationally. This doesn't sound too bad does it? What though are the standards that GS1 wishes to have set? One of these is the GS1 Global Traceability Standard which requires everything produced for any use be tagged and identifiable via varying means, from bar-coding to RFID chipping. Among the Traceability Standard we also find that any machine used in production of materials must be identifiable in the same way. The same can be said for trucks, planes, or boats shipping the goods, crates which goods are packaged in, stores where the merchandise is sold, as well as any other aspect which influenced the production or sale of the product. The products range from cell phones, to fresh produce, to automobiles, to clothing, as well as anything else that can be produced or sold. In a normal world this is where a supply chain ends. However, in the GS1 dictionary, supply chain means from start of production to the end of a products life. This means they want continual information on the product long after you have purchased it. Another aspect that must be taken into account is the traceability standard that states the system must incorporate real time identification of parties, items, and events that have had a relationship with the product within its life. Did you catch that? Parties!!! According again to GS1 and their standards, parties refers to any individual involved in production, shipping, sales, or purchasing of a product. How was it GS1 proposed to identify things within the supply chain? Does GS1 have different systems in place to identify these parties? No they do not. GS1 proposes to identify YOU the same way they want to identify every other object, through RFID. Now that we have established a desire by a group to do such a thing, one is left wondering is this fanciful talk or a viable threat? To answer this, let's look at who is working to implement GS1 standards. Driving forces for GS1 include North Atlantic Treaty Organization, World Trade Organization, World Health Organization, and World Customs Organization. Partners of GS1 include corporations influencing all walks of life including, Microsoft, Baxter, GM, IBM, Pfizer, Walmart, Google, and many many more. So many more that the odds are much better of you guessing who is on the list than who isn't. GS1 has branches in many of the countries which have agreed to implement their standards, these include India, Japan, China, Russia, the EU, and the United States. In the United States, GS1 has partnered with the US Chamber of Commerce, FDA, Department of Veterans Affairs, Department of Defense and many others to see to the implementation within the US. In June 2009, the EU GS1 launched the Transatlantic Traceability Infrastructure (TTI) Project. This part of the project was designed to fast track RFID implementation across Europe. What has remained quiet is that TTIP is a collaborative agreement between the US and the EU to fast track implementation in both. The projects of GS1 take into account anyway someone may purchase a product. This includes a section on Ecommerce which by its own definitions would make the Internet of Things a reality. There are also provisions for ordering products over the phone, which we will explore in more depth in a upcoming article. Now that you have a basic understanding of GS1, you may ask how far out is full implementation? GS1 has available on its site implementation projections which are sobering. According to GS1, 2009 was to be the year of preparation. All products and pieces of infrastructure were to be developed and in place by the end of 2009. Again according to GS1, this goal was met ahead of schedule. GS1 also claims 2010 as the year full implementation and operation is to begin, and again GS1 is ahead of schedule. There are still a couple of sectors where work needs to be done for this to be achieved. One of these is the healthcare industry, is it a coincidence that the Healthcare Reform Bill would make the healthcare industry in compliance with GS1 standards? This subject we will be looking at in depth in a upcoming article. Now that you understand the part of this international organization in implementing a complete RFID infrastructure, we can now go forward in upcoming articles and look at pilot projects, funding, the politics behind the agenda, and much more. This agenda is real, and its implementation will forever alter life as we know it. The provisions within GS1 cover all aspects of business. There are numerous connections to be made, which will take us from captains of industry, to US politicians, deep into the Green movement, to some of the richest men on the planet, to those that were bailed out due to their "bad practices". My upcoming articles will explore these connections and how we got here. While we slept, a trap has been set, one that will soon ensnare the earth. My goal with these articles is to educate those reading in such a way that you will recognize the agenda when you see it. Only then can you be able to educate others. I encourage questions and discussion and will do my best to answer any directed my way. Susanna is well educated on this subject as well, and I must convey a great deal of thankfulness for her help on this project. Without her this project would not be as full of information as it is. To all others who have sent me information or have expressed an interest in this agenda, I thank you as well and hope this first article has been educational. For the rest of you, stay tuned as we are just getting warmed up! Another Michigander, "JD" of Battle Creek is starting an extremely important new blogspot which will be mandatory reading for those of staying abreast with what I have shorthand labeled for years as "The Cashless Society." I have been trying to balance my law practice and wrap my arms around his extensive research for some time now and I am thrilled that he is devoting an important internet forum to it. I have much to say and little stamina to saying it right now. I have been asked to judge regional law school competitions in Detroit next weekend. To be asked is an honor in my profession and I am balancing that this week as well. Needless to say, much is happening. It looks like chaos is breaking out all over -- we have to pray daily to survive it and stay in the Lord's will -- our only refuge from the trying times at hand. Stay tuned -- JD's blogspot, Rich of Medford, Holly Pivec, Herescope, as well as here . . . The Brookings Institution -- Partner on Internet CONTENT regulation? Javier Solana who has long since been dismayed by fundamentalists "taking full advantage of the global village", i.e. Internet, now joins an institution that appears to be on the same page -- the Brookings Institution. The Brookings Institution is headed by Strobe Talbott who was a close confederate of one of his World Federalist Society presidency predecessors, Donald Keys. A speech was just delivered there by the high level Federal Communications Commission Chairman Julius Genachowski who apologetically explained that when he talked about INTERNET REGULATION he met regulating INTERNET CONTENT, not INTERNET LINES. I suspect the party is about to get much rougher for us. The new link to access my downloadable books and materials is: http://public.me.com/cumbey/. What did Strobe Talbott say? "Javier will make a significant contribution to the institution's global agenda," Brookings President Strobe Talbott said in a statement." I rather suspect that is true. Busy, busy, busy -- Acciona, Spanish Security Strategy, Business College Professor, The Brookings Institution . . ."
Will Israel Join the European Union? - Speculation or insight? Is it possible that Israel will join the European Union? Italian Prime Minister Silvio Berlusconi, who was on an official visit to Israel, said Monday that his "greatest desire" is to see Israel join the European Union. “There is no country outside the European continent that has this type of relationship that Israel has with the European Union. "Israel, allow me to say, is member of the European Union without being a member of the institution. It's a member of all the programs of the union, and participates in all of them. And I'd like to emphasize and underline, with a very big, thick line [that Israel participates] in [helping us deal] with all the problems of research and technology, which are very important." "I am sorry to say, but I don't see the president of Croatia here," Solana continued, referring to Stjepan Mesic, who is also attended the three-day conference. "His country is a candidate for the European Union, but your relation today with the European Union is stronger than [our] relation to Croatia.” The EU and Israel have committed themselves to establishing a partnership which provides for close political and mutually beneficial trade and investment relations together with economic, social, financial, civil scientific, technological and cultural cooperation. The Action Plan concluded with Israel has an objective to gradually integrate Israel into European policies and programs. Every step taken is determined by both sides. There is also a financial assistance element to EU-Israel cooperation - Israel is eligible for €14 million in European Community financial cooperation over the next seven years. As much as tensions have risen between the EU and Israel, "Ron Paul Israel / IsraelFinancialExpert's perspective is currently difficult to see, but then, who knows? There is an interesting development on the European Union scene. Javier Solana went relatively underground in December, but his alter ego spokesperson, Cristina Gallach, is now serving as spokesperson for the Spanish rotating presidencies now in place for the EU and Western European Union. 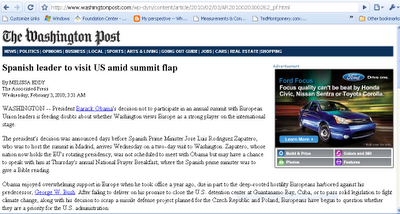 President Zapatero of Spain is coming to Washington to participate in the Presidential Prayer Breakfast. He will be President Barack Obama's guest. At the same time, Barack Obama has apparently decided to insult the European countries by not participating in their summit. They are taking that as an apparent clue that the USA no longer regards the EU as a significant player on the international scene. There are prophetic messages in the Book of Revelation that this situation could possibly fit. There were 10 kings who came together solely to hand their power to "the beast" who in turn would pull 3 kings (countries?) up by their roots. It appears increasingly possible to me that the powers would be handed over for those kings of relatively smaller powers to equalize themselves with a much greater power. A literal and figurative USA snub of the European Union might just be enough to trigger the impulse! I wonder where Javier Solana is and what he is doing? When he was running the EU foreign policy, they had R E S P E C T to put it in Detroit singer Aretha Franklin terms. I suspect that we might be seeing him again -- very soon.